These less-understood realities of animal oppression, in addition to raising troubling questions about our relationships to other animals, thus raise troubling questions about our relationships to other humans. When (and if) the general public is able to seriously acknowledge them, how will we react? How should we? Behind the sanitized world of fast-food, everyday grocery shopping and culinary delights—all meant to satiate to our basic pleasures and needs—is an extraordinarily vast realm of brutality as normal and routine as our mealtime habits. I am referring, of course, to the often ignored truth of slaughterhouses: that billions of animals raised and slaughtered every year for food are forced to endure unimaginable suffering. What society does to produce food is obviously bad for other animals. 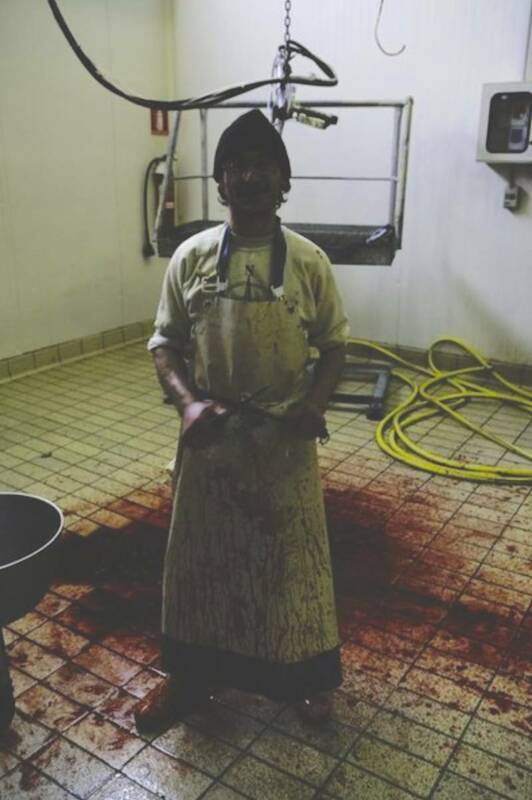 What is less obvious, however, is the lesser-known fact that slaughterhouses are also bad for the hundreds of thousands of employees who work in them—for very low wages, with little job security (most are “at-will” employees) and in highly dangerous conditions. The golden rule in meatpacking plants is “The Chain Will Not Stop.” USDA inspectors can shut down the line to ensure food safety, but the meatpacking firms do everything possible to keep it moving at top speed. Nothing stands in the way of production, not mechanical failures, breakdowns, accidents. Forklifts crash, saws overheat, workers drop knives, workers get cut, workers collapse and lie unconscious on the floor, as dripping carcasses sway past them, and the chain keeps going. The worst thing, worse than the physical danger, is the emotional toll. If you work in the stick pit [where hogs are killed] for any period of time, you develop an attitude that lets you kill things but doesn’t let you care…Pigs down on the kill floor have come up and nuzzled me like a puppy. Two minutes later I had to kill them—beat them to death with a pipe. I didn’t care. Moreover, institutionalized animal cruelty not only directly harms slaughterhouse workers, it harms (and is likely to harm) non-workers as well; as one journal recently found, the desensitization of suffering is causally linked to a higher propensity for committing violent crimes, particularly domestic abuse. “[I]t had been established that the more positive a person’s attitude to animals, the lower their aggression levels, and that the reverse is also true – if you’re cruel to animals, you’re more likely to be violent to humans.” (Hence even on Kant’s view of animals, according to which they lack intrinsic value and therefore humans owe them no direct duties, this empirical fact would obligate practical vegetarianism, if not veganism). For a highly extensive, personal account of the damaging psychological effects of slaughterhouse work, see “Slaughterhouse Worker Turned Activist” - United Poultry Concerns Talks with Virgil Butler (a Tyson slaughterhouse worker turned animal rights activist) and his partner Laura Alexander. Another review of Timothy Pachirat’s book, Every Twelve Seconds: Industrialized Slaughter and the Politics of Sight. See also James McWilliams’ interview with Pachirat here. This essay, and more of Spencer's work, is also available on the Animal Blawg site.